Swindle is always looking to make a score. He�ll cut a quick deal or pull a fast con � anything to bring in a profit. His wheeling and dealing isn�t limited to gear and weapons. He�ll sell out anyone, Autobot, or Decepticon, for the right price. Swindle holds a little special place in my heart. Having had the opportunity to catch up on all of the G1 cartoon series about 5 years ago, I got a kick out of him. His shining moments were in the episode B.O.T. All the Combaticons, save for Swindle, we disabled during battle. Swindle seized the opportunity, and sold off his former comrades. It all comes crashing down eventually, but I found it very entertaining. Having the ability to play as Swindle in the video game Fall of Cybertron is also enjoyable, and if I remember correctly, he has some pretty good lines. Swindle pulls off some funny feats from time to time, and those have stuck with me over the last few years. Previously, I owned one Swindle figure: the Generations Fall of Cybertron version. At first I liked the figure. But when the honeymoon ended, the issues with the figure (and the Bruticus set in general) arose, and in true Swindle fashion, I sold off the set. Now, since the late waves of Combiner Wars figures have made their way to discount shops, I was able to pick up Swindle for cheap. I absolutely don�t regret it. 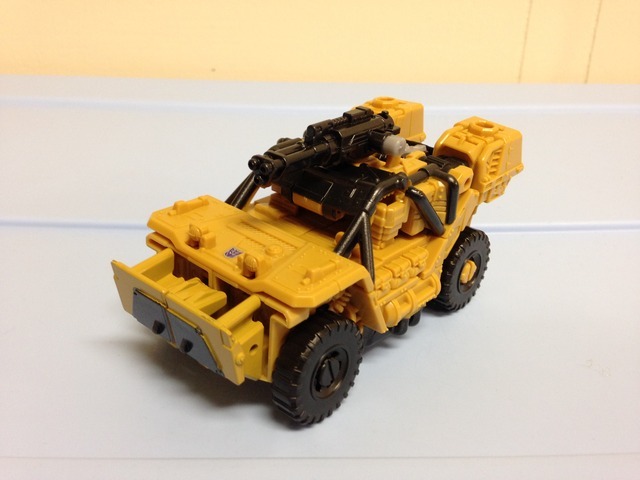 Swindle�s alternate mode is a militarized SUV/Jeep. This mode has detail everywhere: pouches, packs, pipes, bars � you name it, it�s there. Except for seats. He probably sold them off. The color palette is pulled from his G1 likeness � a tan color with some black detailing (wheels, rollbar) and a small Decepticon symbol or two. It�s a good look, but won�t win any awards for beauty. The SUV mode tabs together tightly, and everything feels secure. Since he�s basically a box on wheels, there really isn�t anything that can break on him while in this mode. It�s sturdy and well done. The SUV rolls well too, adding a bit of play function. Swindle�s included gun � which looks like a 3-barrelled Gatling gun � can be pegged onto the top of the SUV or on the back corner. Personally, I prefer the top. You can also peg the Combiner hand/foot/weapon too, but it looks out of place to me, so I leave it out. Overall, you�ll find a solid, but not noteworthy, alternate mode with Swindle. The Combiner Wars figures all have rather quick and simple transformations, and Swindle is no different. Everything moves quickly and nothing tabs too hard or is tricky to shift. Swindle�s robot mode is proportioned well, and quite reflective of his original toy. He�s got some chunky lower legs and beefy upper body, while the waist area is rather thin. Overall he�s well detailed (especially in the shins) and well colored. The majority of his color is the tan/yellow plastic, with some black, purple, and teal detailing in the torso. The head mold is nice, if a little dark, but it�s done with a metallic flake plastic, as are the purple eyes. 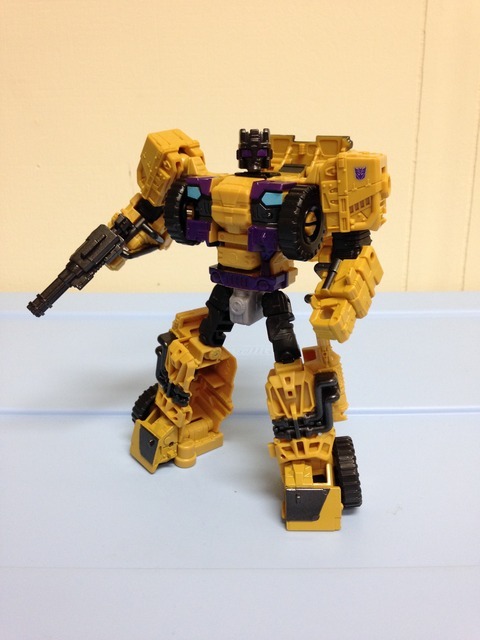 Overall, Swindle has a great look, even though he�s a retooled version of Rook (I rhymed!). Articulation is good on Swindle. Shoulders, arms, elbows, waist, hips, and knees all have great motion and the joints are snug. They move well and you can move Swindle into some great positions � all bolstered by the way his feet are designed. The feet have some hinge joints that allow them to flatten out a bit when the legs are at an angle � this really helps his ability to hold positions. The weight is well balanced too. Swindle comes with two accessories: the aforementioned Gatling gun and Combiner weapon. Either can be pegged into his hands or on his shoulders, but I prefer to use only his Gatling gun. As with all Combiner Wars deluxe figures, Swindle can be transformed into a leg or an arm. Personally I think he works best as a leg, which is his typical use in Bruticus anyways. Mostly this is due to his boxy alternate mode. 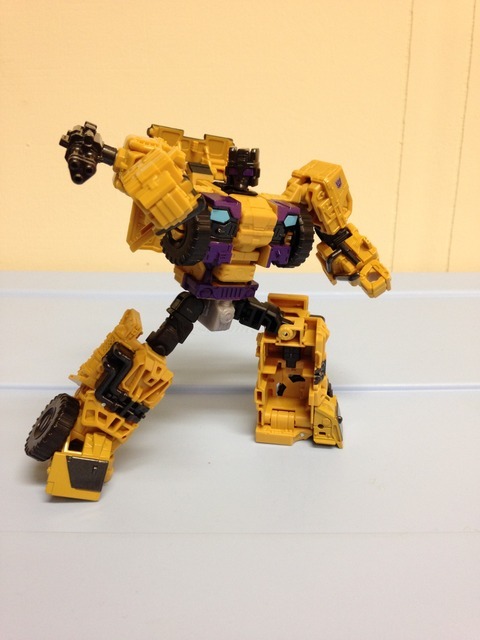 As a part of Bruticus, Swindle shines � it�s his true intention. As a standalone figure, Swindle is still really good. The design works well (as opposed to his repaint � Hound), and both of his modes are solid. 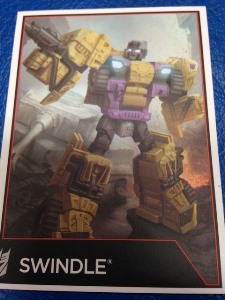 In my opinion, Swindle is a good addition to your collection no matter how you use him (or rather, how he uses you. He is a con-man, after all.). Transformation Design: 5. Simple and effective, but not noteworthy. Durability: 9. Good quality materials used, nothing seems flimsy. Fun: 7. He�s pretty good all around. There isn�t a ton to do with him, but add in the Combiner feature and you�ve got something. Aesthetics: 8. He�s not beautiful, but he hits all the marks for Swindle. Articulation: 7. He got joints and good range all around. Extra points for the hinged feet. Value/Price: 8. If he can be found at a discount store (isn�t that ironic?) he�s a blast to have. Overall: 7. When it comes down to it, you don�t need to search the ends of the Earth for Swindle. If you come across him though, pick him up. He�s worth it. If you�re making a Bruticus, this one�s a must.